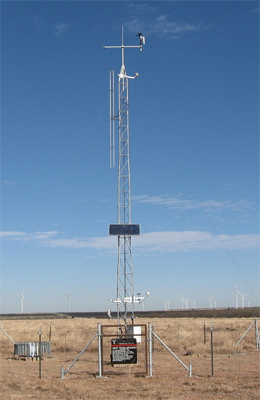 The West Texas Mesonet (WTM) project was initiated by Texas Tech University in 1999 to provide free real-time weather and agricultural information for residents of the South Plains region of western Texas. The network has grown to include 51 10-m-tall meteorological stations, one radar wind profiler, one acoustic wind profiler, and one upper-air sounding system. It was recently expanded westward into New Mexico to help provide weather data for ranching and wind-power interests. Weather information from each surface station is transmitted every five minutes back to a base station at Reese Center (12 mi west of Lubbock, Texas). Agricultural data (including soil temperature and moisture information) are transmitted every 15 minutes. All real-time data collected from the surface stations are available on the main web page at www.mesonet.ttu.edu. The WTM uses Campbell Scientific dataloggers, towers, enclosures, communication devices, and a wide variety of sensors. The stations measure numerous factors of wind, air temperature and humidity, sunlight, soil temperature and water content at multiple depths, precipitation, and barometric pressure. There is no grid electricity at any station. The sites use 20- or 50-W solar panels to charge two deep-cycle gel-type marine batteries. Power use is so great at several of the major radio repeater stations that they need to use two 50-W solar panels to charge three batteries. Each datalogger has a backup set of internal batteries to save data in case of a major failure in the marine batteries. Texas Tech cooperates with the National Weather Service (NWS) by providing high-quality meteorological and agricultural information to a region where the NWS would find few data sources. In return, the NWS relays WTM data to the media and surrounding community through warnings, forecasts, local storm statements, and other reports. The NWS also helps with the communication costs at many stations in the WTM domain. The huge treasure of data from this mesonet is available for free on the Internet. It is displayed in various formats for the various users: agriculture, wind-power industry, media outlets, schools, community leaders, emergency management, and the general public. The website receives an average of 35,000 hits per day, and has had as many as 110,000 hits in one day.